Living in a Cave doesn’t have to be Primitive. Far from it. G disappeared with his iPad while I chatted to the lady running the coffee machine about politics and high finance. No, not really, she wanted to know why English people came to Cordoba when they could go to Marbella instead. I asked her if she’d ever been to Marbella and she said no. It was a bit of a strange conversation really as her English was worse than my Spanish so we waved our arms about and smiled a lot. G came back, said ‘all sorted’ and off we went. He wouldn’t tell me where we were going, even after I had taken about fifty guesses. Usually, this irritates him so much he ends up telling me, but not today. 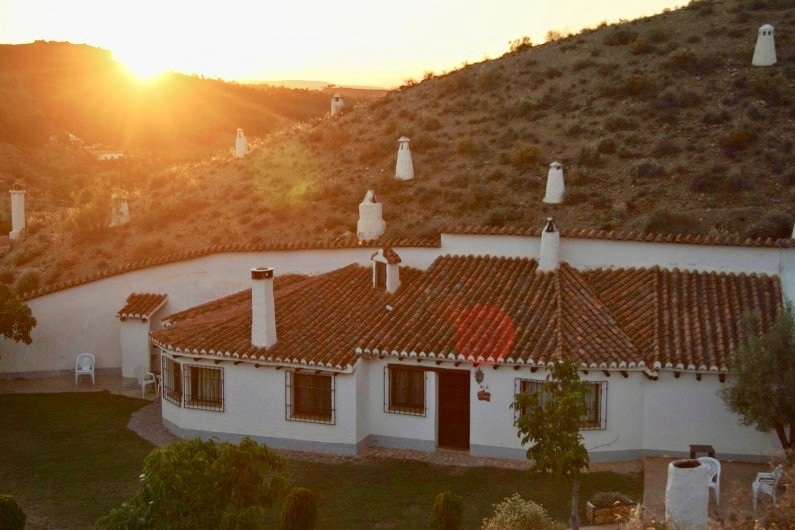 We’ve been to Guadix before, even stayed here, in a hotel, and have seen the cave houses, but never stayed in one. Well, we would be staying in one today. The directions G had been given were terrible but we found it in the end. The lady who met us, who I called Linda as I misheard her name and she was too polite to correct me, was lovely and spoke good English. She took us to ‘our’ cave and showed us round. She looked after ten caves in all and was a cave expert. She told me she was fifty years old and had been born in a cave, had lived in cave houses most of her life and her mother still lived in the same cave house where she had been born. 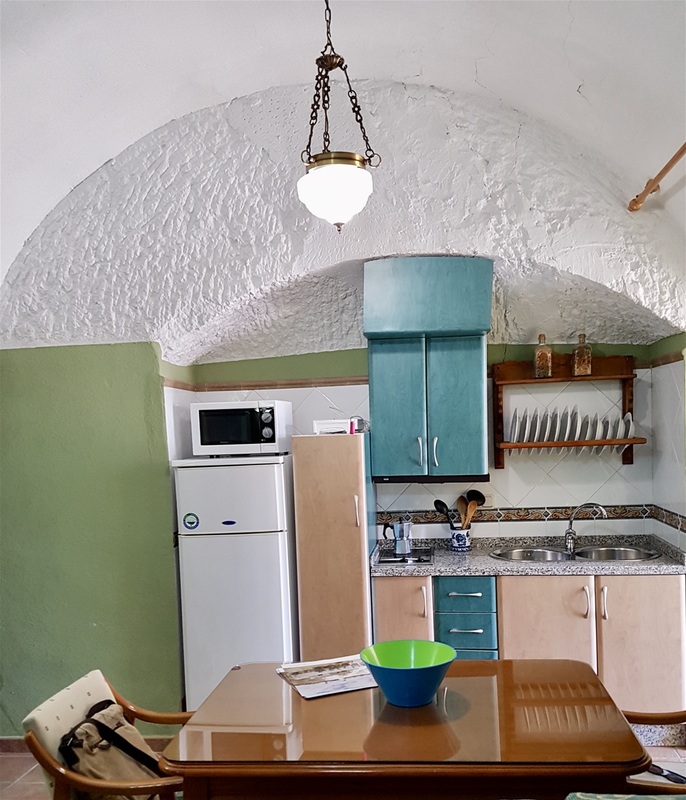 Our cave house was lovely, with a living area and a little kitchen, not that we had anything to cook in it, a separate bathroom and a really cozy bedroom, all the rooms with whitewashed rough ceilings but Linda’s cave house had been very different. There was no electricity or heating, no water and no bathroom so they had to collect water from the river, a long way away. Hard times. 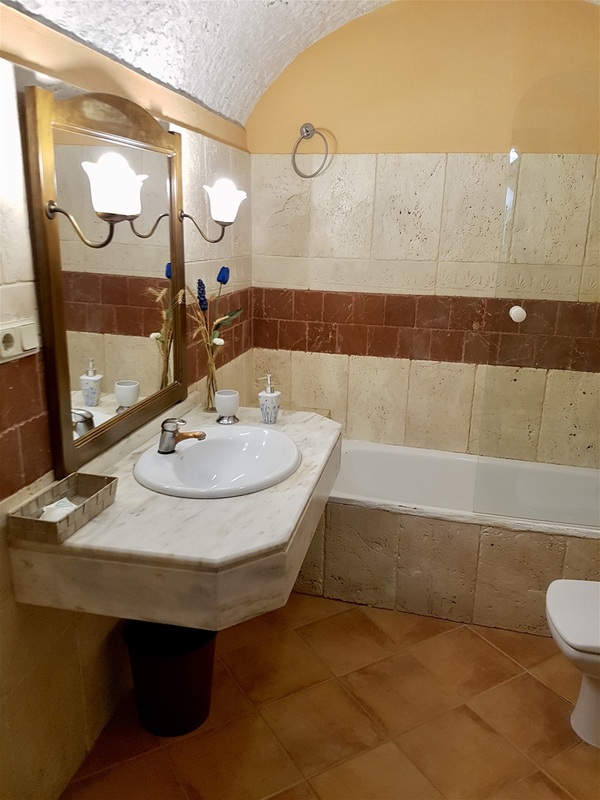 She said it had been very exciting when her father dug out an extra room for a bathroom when Linda was thirteen. G tells me we’re actually in Benalúa, just outside Guadix, and to be honest there’s not much going on around here. It’s a desert area, very dry with lots of humps and hollows and it’s here, in this land that nobody else wants, that most of the cave houses are found. Linda, still don’t know her real name, took us into a restaurant near by that had only opened a few days ago and introduced us to the owner, a big, not very friendly woman, and said we should walk down to eat here tonight as it would be ‘an experience’. G wasn’t that keen, but we were hungry and I didn’t fancy banana sandwiches so we booked in for eight o’clock. Six o’clock would have been better, but Spanish people eat late and eight o’clock is early for them. We got to the restaurant and we’re the only people here apart from two young girls and a lad, aged about 18, who were sitting at a table with about twenty empty beer bottles on it. The music was deafening and we asked our waitress if she could turn it down. She went off and turned it down, only a bit, and the lad on the beer table started shouting at her to turn it back up again, but she ignored him. It wasn’t, actually, but we sat down next to a roaring metal stove, a really big one that burns pellets. They’re very expensive things, but even sitting right next to it we couldn’t even feel any heat. The girl slid over again in her patent leather shoes with slippy leather soles, about as bad a choice as is possible for waitressing, but they looked nice which is important when you’re seventeen. She said she was the only one there who could speak English, but she didn’t speak it very well. There wasn’t a printed menu, but she told us what we could have, hardly understood a word. We asked her, in Spanish, what the choices were but we still didn’t understand her replies. ‘How bad can it be?’ G said and we ordered a starter and a main course. 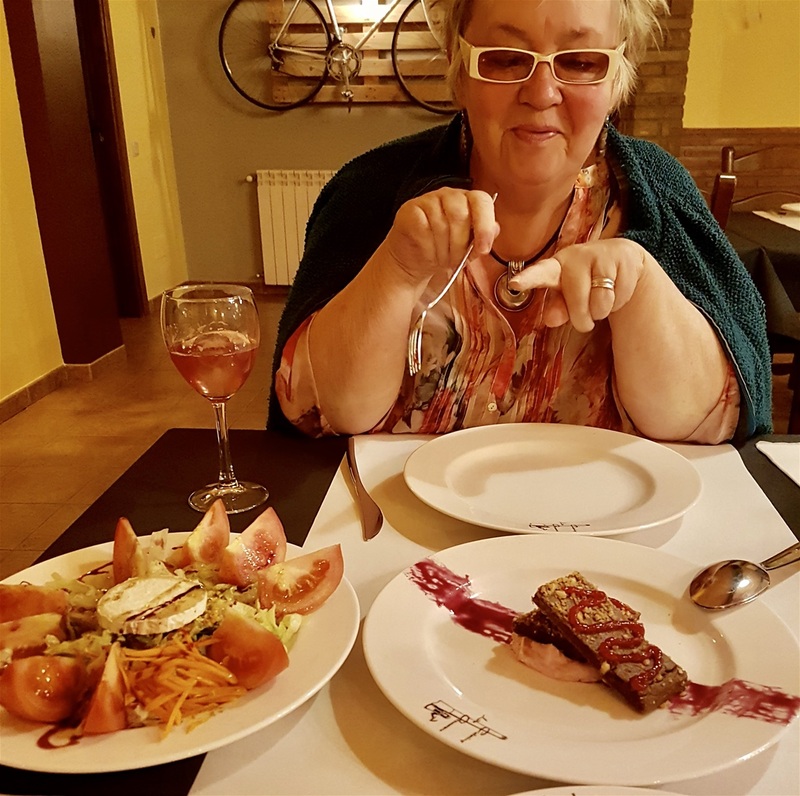 He ordered pate and I ordered a ‘special’ salad as starters, but we had no idea what the main courses were. ‘Lamb something’ was about as far as we got with one and ‘no idea’ for the other..
My salad was okay, just a salad, not very special, with a slice of very hard goat’s cheese perched on top. G’s pate looked interesting, but was pretty vile. It turned out to be black pudding, but looking like a slice of cake. Pigs’ blood cake. He ate it though. Main courses were lamb chops for me, with a fancy name, and G got a big pile of chips smothered in a weird sauce and chunks of meat on top. We couldn’t decide what the meat was. I said pork, G said donkey. We both left at least half, very unusual for us. Oh, we had a free glass of local white wine too. It was called mencal and comes from the bodega up the road somewhere, the waitress said, called Pago de Almaraes. We both agreed not to bother visiting the bodega. Everybody talks about the main thing about living in a cave is that it’s cool in summer and warm in winter. Very energy saving and ‘worthy.’ Bet those people buying hem up are all Guardian readers. It was cool when we arrived here, pretty warm outside by then, and when I got up in the morning I looked out of the window and saw frost on the car windscreen. ‘It’s cold out, but really toasty in here, in our very kind to the environment cave,’ I shouted to G, just before I walked past a radiator I’d not even noticed last night and it was hot. Central heating. In a cave. How decadent. What about the environment? Saw Linda on leaving. She asked about our meal. We both said “fabulous, thanks”. Pathetic! Guadix is fascinating, but G will tell you about all the history stuff. 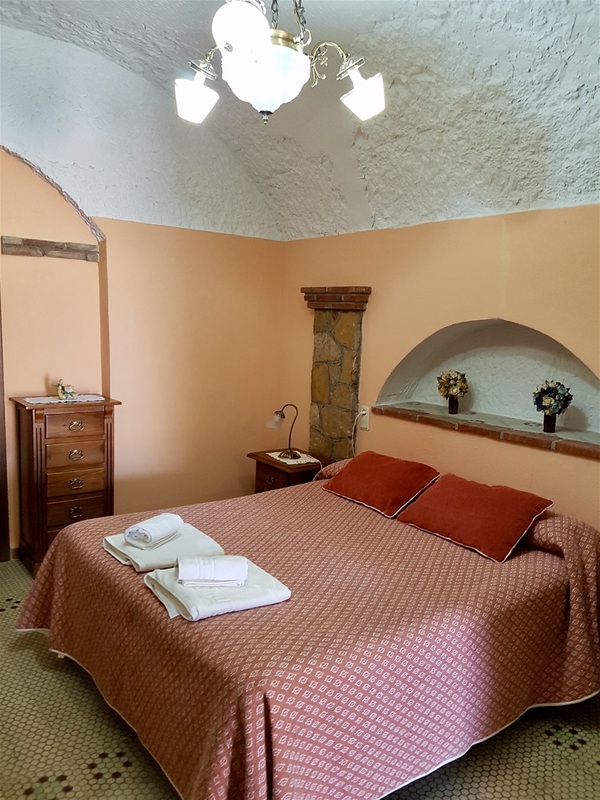 Interesting stay in a cave house. It took a bit of finding. In fairness the directions I had been emailed were a bit vague. Cave dwellings are fairly random as regards having actual addresses and the ‘map’ that accompanied the directions resembled a Venn diagram crossover. We got there, eventually, after discarding the instructions and relying on local knowledge. The man I chose to ask would not have been my first choice, but it’s not exactly Regent Street so there weren’t many to choose from. He had a spectacularly large nose, very thick glasses and was wearing a coat tied at the waist with hairy string. 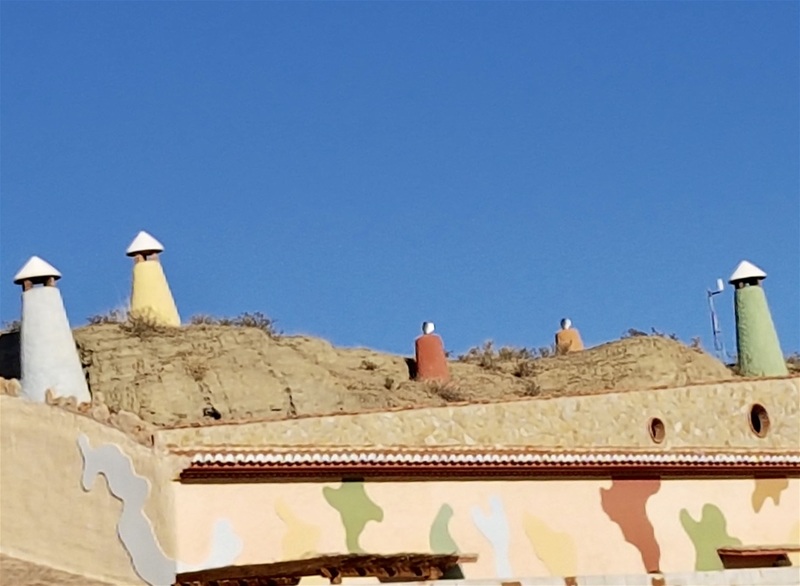 He didn’t speak English and I didn’t understand his spoken Spanish – I suspect it wasn’t even Spanish – but he knew where to find cave houses well enough. There are thousands around here, but I showed him a photo of the cave house in question, looking like every other cave house I’ve ever seen, on my iPad and he nodded, waving his arms about and ‘speaking in tongues,’ at high volume the whole time. No idea what he actually said, but ‘keep straight on for a bit and stop at the top of the hill’ was the gist of what I perceived his gestures to mean. Of course, after driving on for a bit and stopping at the top of the hill, we found the very place we were to spend the night. The lady who greeted us was very slim, very dark and very exotic. Marigold is pretty exotic herself, so they hit it off immediately. My only contribution was to mend the printer in the office. Paper jam, if you’re interested. The house itself was one of many around here, each with a while chimney poking up from the earth on the hillside above. On entry it didn’t appear much different from a conventional house, after dark in particular, and much more comfortable than our hotel in Cordoba. I’d expected it to be dark inside, but there was a big window and a glazed door so it wasn’t at all gloomy. It all felt very peaceful, admiring the rough hewn walls and ceilings and watching the languid progress of dust motes reflected in the sunlight outside. Very hushed, very peaceful, a place for relaxation, for contemplation. This peaceful interlude didn’t survive the arrival of Marigold and her insistence there was a wolf on the hillside. We went outside again where a scruffy dog was busily engaged in digging a hole in the sandy soil accompanied by excited yelps. In fairness, he did, very slightly, resemble a wolf, but we felt able to take a walk around the area without fear of being savaged. We were persuaded to go to a restaurant last night and can safely say I’ve enjoyed root canal work at the dentists more. Our waitress, first job and it showed, was lovely though. I’m still worrying about her slippery and completely inappropriate shoes and whether she ended up in A and E last night. Just hope, when she eventually slipped over, as she must surely have done, she wasn’t carrying a great load of food out from the kitchen. On second thoughts, it would have been better for us if she’d dropped all our food and we’d gone home for banana sandwiches instead. Not the finest example of Andalucia cuisine, but perhaps standards are not very high in Guadix. Food to be endured, not enjoyed. Pity we’re British, so we don’t complain. Not at the time, anyway. Marigold will probably still be grumbling away about last night in a fortnight’s time. 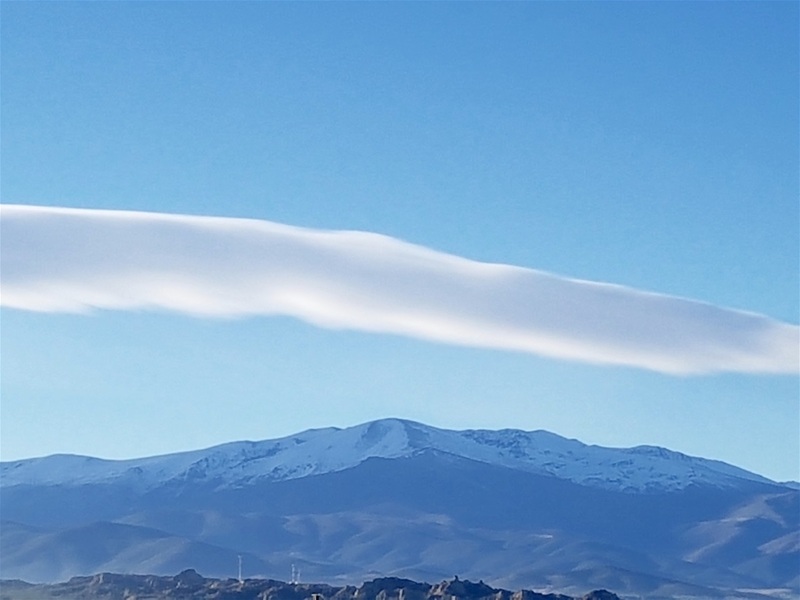 The name Guadix stems from the Arabic 'Guadh-Haix', which means 'River of Life.’ A famous French explorer once said, ‘Guadix is a city that should not be described; it must be seen.’ That’s true of many places, but I’m not going to argue with a revered French traveller. 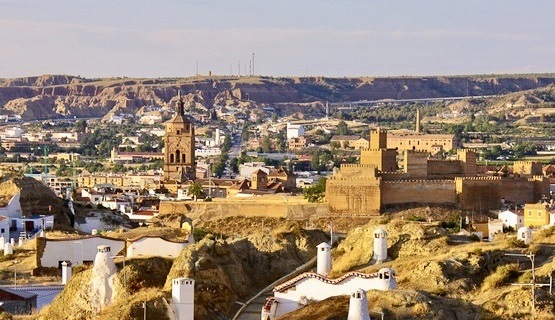 Guadix is one of the most oldest cities in Spain with a rich history behind it. Evidence exists of prehistoric settlements as both Neanderthal and Palaeolithic remains have been found. 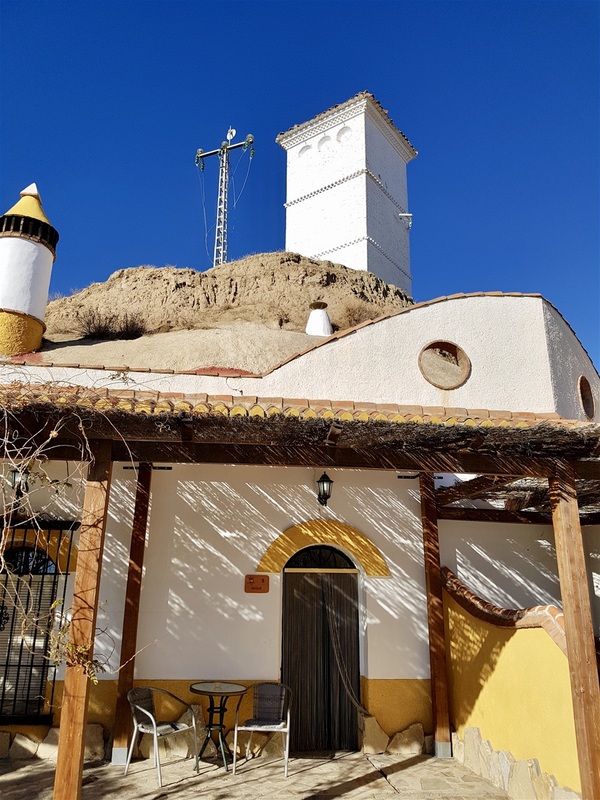 Guadix dates back to pre Roman times when the early Phoenicians settled here, naming it Acci, but gained much of its importance with the arrival of the Romans as it formed a staging post on the Roman Road, the Via Augusta. Julius Caesar instigated the mining of silver from the nearby hills in 45 Ad, renamed it Julia Gemella Acci, and Guadix became important for the minting of silver coins. 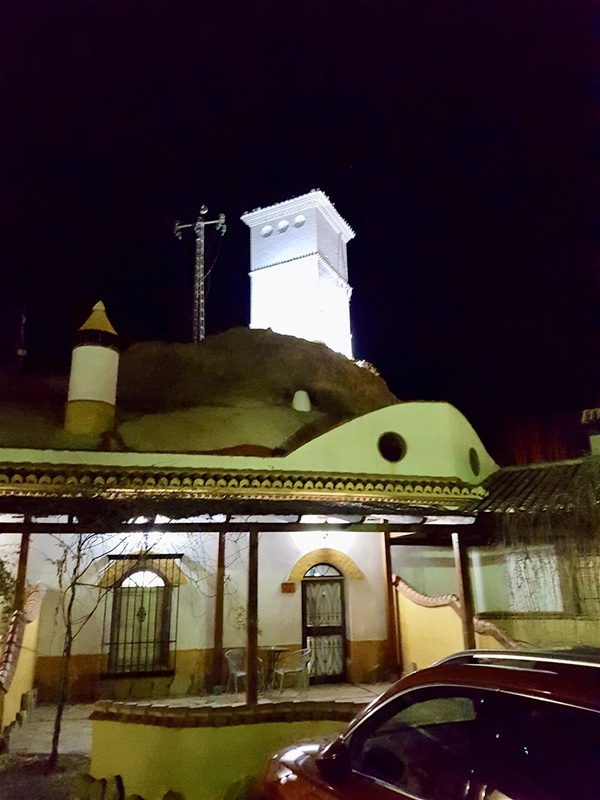 Guadix was taken over by the Moors who ruled Andalucía from around the 8th to the 15th Centuries. They built the Alcazaba, the magnificent Moorish fortress that still overlooks the city in the 11th Century. 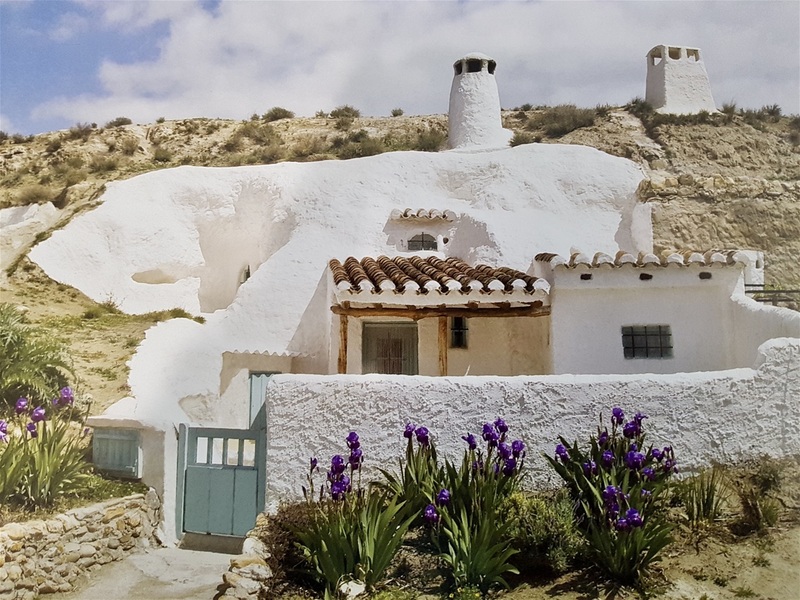 As with the Roman occupation, Guadix was an important trade town, as it was midway between the great Moorish stronghold of Granada, with its magnificent Alhambra Palace, and the coast. Over the course of two thousand or so years, Guadix has suffered more of the vicissitudes of history than most places, but it still survives. It was the Moors, or perhaps more accurately the decline of the Moors after the Christian Reconquest, who were responsible for so many of the population adopting cave dwellings as their permanent homes and it is this prevalence of cave houses that drew us, along with so many others, to this ancient city on a plain overshadowed by the majestic Sierras Nevada. The Moorish citizens of Guadix founded an important silk industry, on a par with that of the more celebrated Granada, but after the recon quest of Spain, those remaining who still espoused the Moorish ways and beliefs were expelled by the Christians and many from Granada arrived in Guadix as refugees. Their only option was to retreat into the surrounding hills and live in existing caves, or create new ones. The rock in this area is favourable for excavations as it is soft and pliable, but hardens after exposure to the sun. 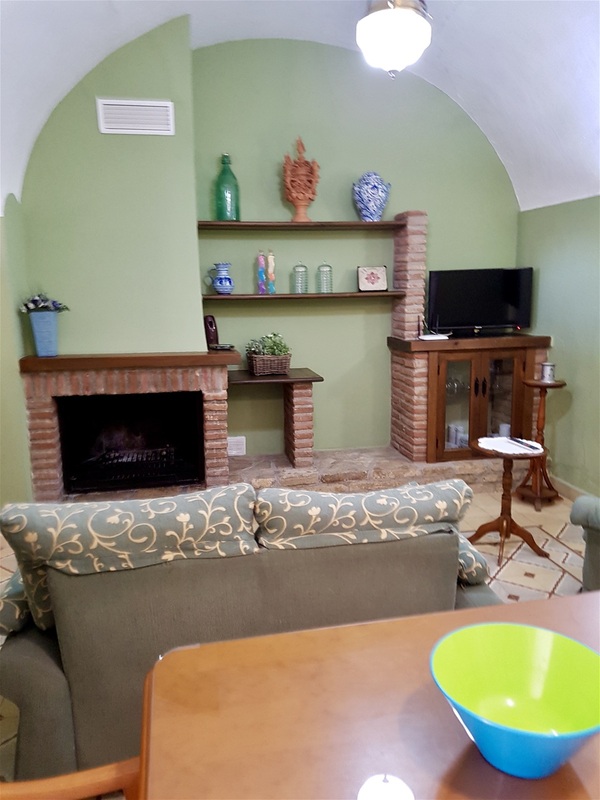 One great advantage of a cave house is the year-round constant temperature, a comfortable 20 degrees centigrade, and whether in the grip of winter or even more beneficially in the savage heat of a Spanish summer, when it's 40 degrees outside, the benefits are obvious. There are over four thousand cave dwellings in this area, the biggest inhabited cave settlement in Europe. Half the population of Guadix are Troglodytes. This area is like a lunar landscape, unsuitable for farming or for anything else I could imagine, which surely explains why the original cave dwellers, and many of the present residents, were those with low incomes or victims of persecution. I looked up some details, reluctant to rely entirely on Linda’s facts and figures, only to find everything she said was correct. Sorry, Linda, for doubting you. 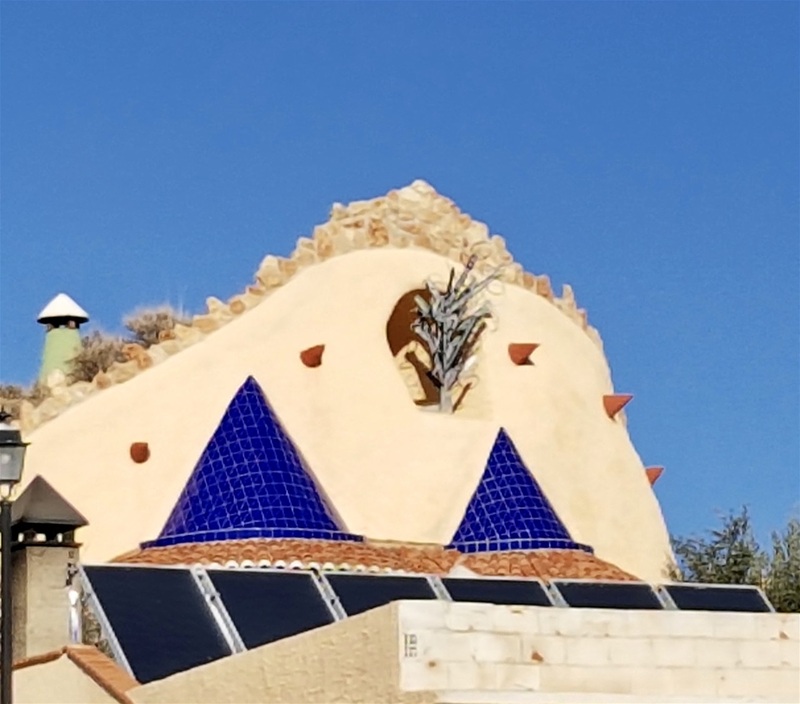 Guadix may have 4,000 habitable caves, but we’ve seen cave houses before, in the Loire Valley, near Saumur, and also visited several of those vast underground wine cathedrals where hundreds of thousands of bottles are stored at a reliably constant temperature. All this pales into insignificance against the reality of China where thirty million people make their homes in caves dug into the hillsides. 30 million may be only a tiny fraction of the population of China, but even so, that’s a lot of cave houses. This area, said the knowledgeable Linda, is famous for ‘star gazing’ with very little distraction from ambient light and on this clear, almost frigid, evening the stars were out in force. We’ve lived in truly remote areas, several times, and this place doesn’t begin to compare with the views of the heavens we’ve seen in the past, but a star filled sky is always an impressive sight, even so. I remember, one star filled evening a few years back now, discussing with an old friend the celestial bodies overhead - my friend’s term, not mine. This was when we were living in an old finca where there were no street lights anywhere to be seen and he pointed out that what we were seeing was not the light emitted by stars but only the light emitted by stars several thousand years ago. Such is the incomprehensible vastness of space, even starlight travelling at the speed of light only represents what once occurred, not the here and now. Yes, we’d probably enjoyed a glass or two of wine before debating such philosophical matters, but every time I see the full majesty of a star filled sky I am drawn back to that evening. Sensibly, we studiously avoided last night’s restaurant as we set off and stopped instead for breakfast at a service station an hour later. One of those where lorry drivers arrive at set times as the bar was crammed with brimming coffee cups indicating a rush was due. We ordered quickly, just in time as it turned out as about fifty or so men arrived in the next five minutes. By the time they left, twenty minutes later, the floor was knee deep in paper napkins and we could hear ourselves think once more. 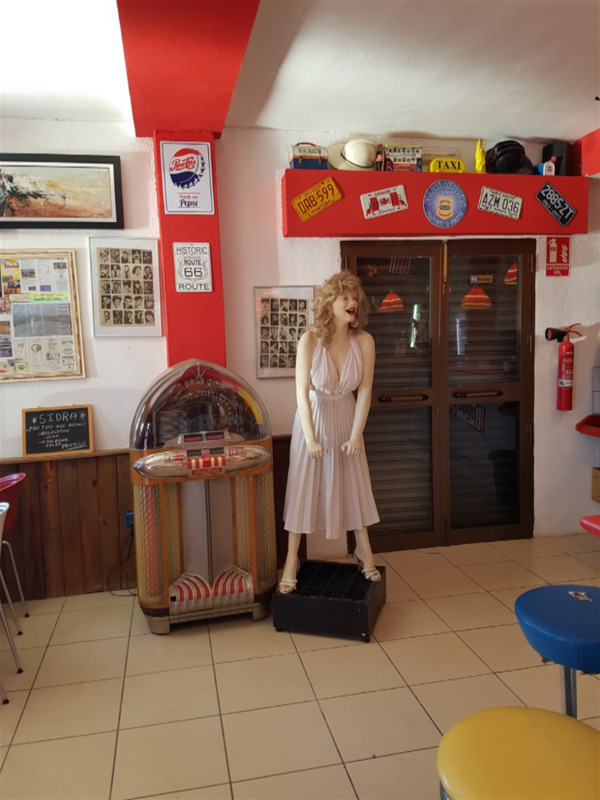 We love workmen’s bars in Spain for their bustle and good humoured banter – notwithstanding the fact we actually understand very little – but they are seriously loud! In France, there’s little more than a hum of conversation, but Spanish bar-goers carry on conversations across a crowded room in a raucous bellow. 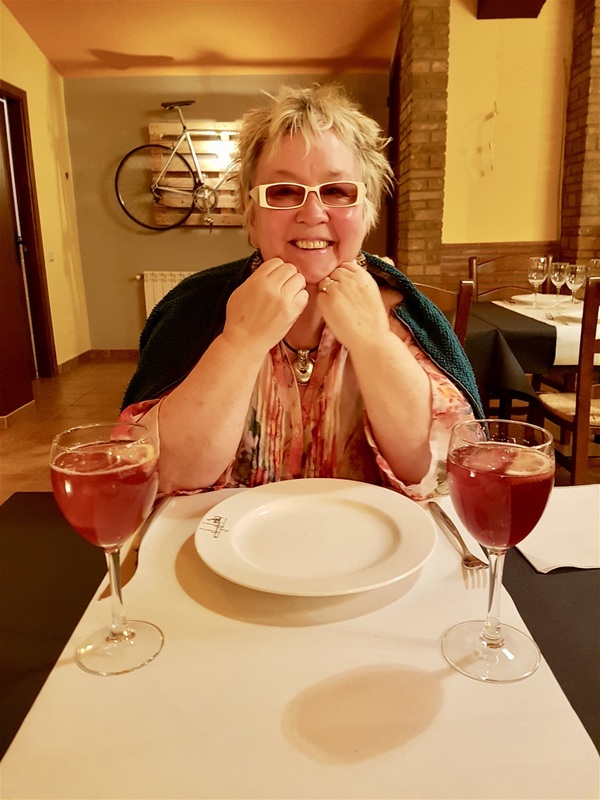 Seated at our table with a delightful view of the car park and three cats exploring the overflowing rubbish bins, Marigold drew my attention to a couple of men at the next table. They were evidently English, middle aged, portly and possibly en route to a fancy dress party. Unkind, I know, and I’m rarely mistaken for a male fashion model myself, but this pair were dressed in the style of Bertie Wooster. When the last of the truckers departed and we were able to hear their conversation, we realised they were on a golfing break where ludicrous outfits are not only tolerated but encouraged. One of them, in a booming, orotund voice redolent of the Shires, explaining his reaction to the Brexit referendum, announced he had been ‘throughly discombobulated by the whole affair’ at one point which gives a fair picture of the nature of our fellow Brits. We finished our coffee and left hurriedly before they attempted to talk to us. Marigold used the word ‘discombobulated’ in every spoken sentence in the next half hour, regardless of context or any perception of whether it was appropriate while I tried to concentrate on the road ahead. Later on, we passed through an arid, uninhabited area of desert. One like many others in this sun baked and isolated region, but there’s something different to be found here. Hollywood used to film ‘cowboy’ films, Westerns, in the wild states of the Old West in the USA. Whether for financial reasons or because the Italian backers for what became known as Spaghetti Westerns didn’t fancy travelling outside Europe, I’m not sure, but film sets were built and filming began in this area and still continues even now. 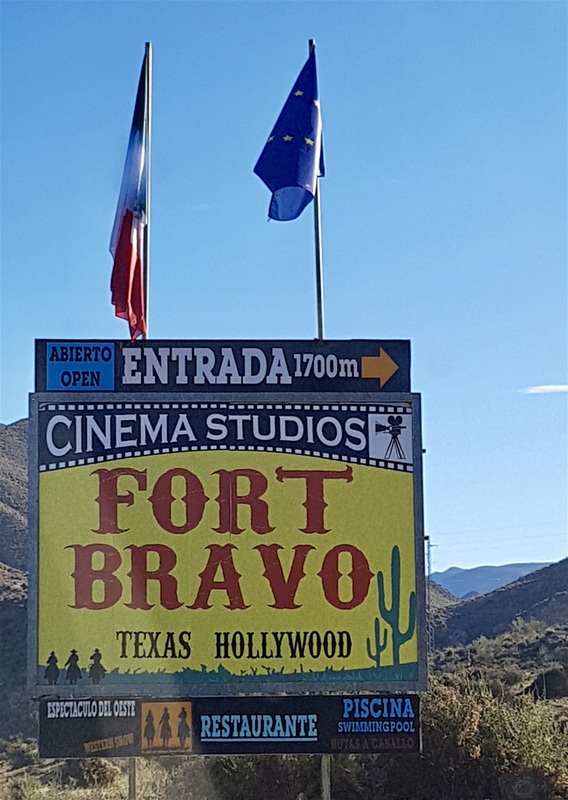 The ‘Western’ town, Fort Bravo was expressly built for the shooting of ‘The Good, the Bad and the Ugly’ and now is a sort of theme park with all the Western settings: a saloon, a jail, shops, a bank and stables. There’s a Mexican film set too, fully fitted out as a Mexican Town. Fort Bravo is one of three similar opportunities for the tourist to experience the Wild West. Entry costs 19.70 euros per person. Did we dally here for an hour or so to watch the recreation of a shootout at the bank or marvel at cowboys riding into town brandishing six-shooters? No, we did not. We didn’t even hang around long enough to meet Clint Eastwood. 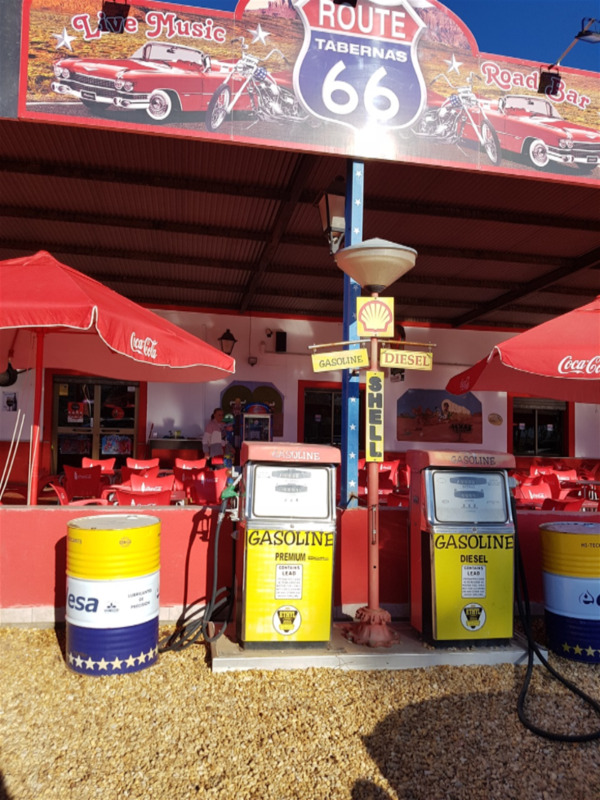 We did stop, however, at a ‘Roadhouse’ modelled on the diners lining Route 66, a little further on absolutely crammed with ‘authentic’ fixtures and fittings and as if as a token sop to minimalism only a couple of ancient, rusty, classic American cars on the forecourt. We drove part of the ‘real’ Route 66 a couple of months ago. This place doesn’t really compare, but I’m sure they’ve tried their best. After all, imitation is the sincerest form of flattery as the well known saying goes. The full “imitation is the sincerest firm of flattery” quotation, as said by Oscar Wilde, however, is: ‘imitation is the sincerest form of flattery that mediocrity can pay to greatness.’ That’s a bit of a downer, then, for these people who fondly imagine they’re recreating a revered image of a traditional roadhouse. As with the ‘Old West’ a few miles back down the road, the original is the best and anything else merely artifice. Almost Christmas and we’ve missed out on the office parties, the last minute dash to buy presents, the tree and decorations and just about everything else, not to mention the Arctic blasts hitting the UK. Same as last year, then. Not sure where we’ll be on Christmas Day yet. That decision can wait a while longer. After all, there’s best part of a week to go yet. Hope Marigold likes the DVD box set of Love Island *I bought for her. *No, of course I haven’t. Marigold is happy now. Mind you, the food hasn’t arrived yet. 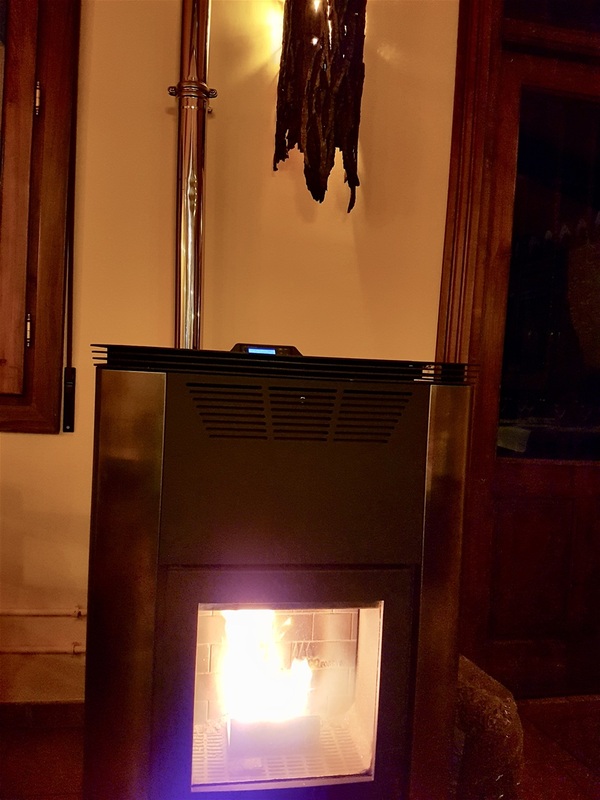 The stove is working hard, but I was sitting next to it and never noticed any heat. Which is the the whole point, yes? Goats cheese salad and er, pate (more like cake) made from pig’s blood. With jam on. I quite liked the jam! 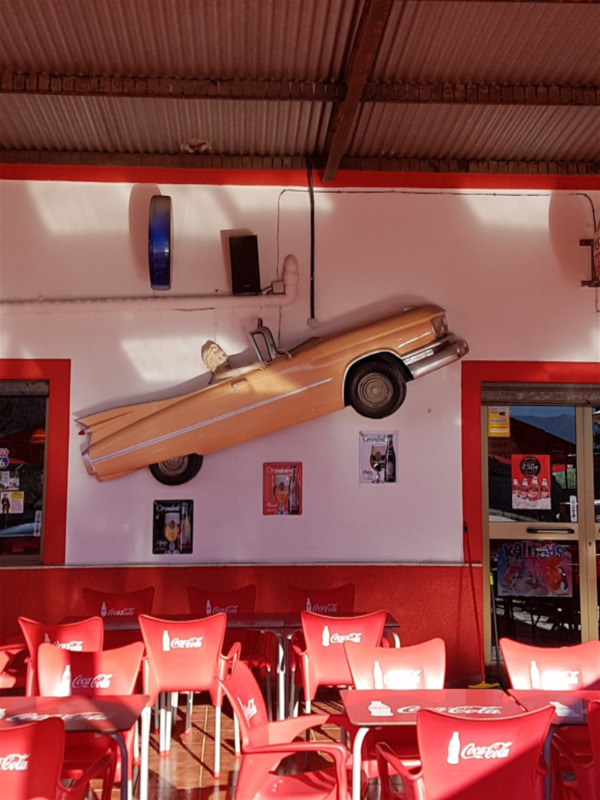 Spanish version of a Route 66 roadhouse cafe. The man behind the counter pointed out his ‘Marilyn Monroe.’ Oh, okay, if you say so. Can’t see it myself. Oh, Norma Jean, if you ever knew about this!